The ESG would like to highlight the disturbing scenes at the nearby CEPSA Oil Refinery today which began showing signs of trouble sometime after one pm. At what was reported as a fire at a fuel storage containment area, flames produced heavy black smoke could be seen as far away as Marbella prompting concerns on both sides of the border. Indeed the ESG received a number of calls from people anxious about what they were seeing with no information to hand. 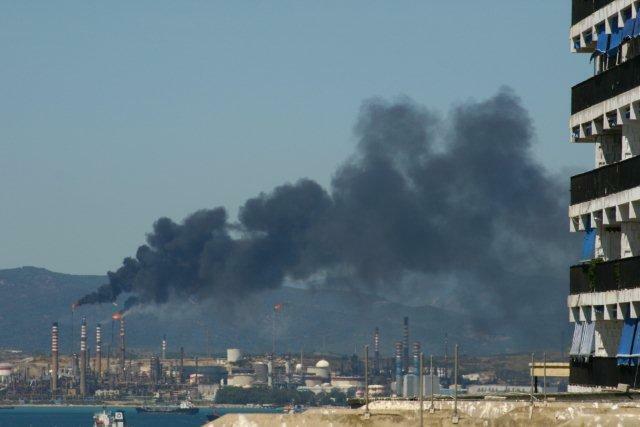 After contacting our Spanish colleagues we learnt that although designated as a control 1 fire by the industry and emergency services, and quickly brought under control (under half an hour), subsequent heavy flaring at the plant signalled its troubles were far from over. The ESG continued to receive calls from concerned citizens and was also in touch with local media in an effort to share what information was available. This incident highlights once again the lack of an official protocol for information exchange between Gibraltar and Spain to quickly and effectively disseminate updates on serious accidents which can have regional impacts on people and the environment. The ESG considers this unfortunate incident as timely on a day where visiting MEP Sir Graham Watson will spend some time in discussion with the group over issues such as CEPSA and compliance, sewage matters and bunkering, among others.